Good morning everybody!! Rise and shine! Don’t you remember your mom telling you that when you were a kid? Mine did and still does every once in a while :o) LOL! Now, go make yourself this delicious, creamy smoothie to brighten up your day… anytime of the day! Pour your choice of cultured dairy into the blender. Add in mango, strawberries, bananas and honey(add flaxseed and/or egg yolks if desired). Give it a whirl till smooth and while it is blending… add coconut oil and let it run for a minute more. Pour into a tall, large glass and top with coconut flakes. Sit outside in the sun and enjoy your smoothie while getting in your Vitamin D dose for the day! Have a GREAT weekend, y’all!! a divine smoothie to start the day! Thank you Veggiegirl and lululu!! Delicious! I’m drooling over here! Hmm…mmm…yum! I would love to try this. Yum! Love mangoes. And the combo here, especially with coconut flakes? Even more yum! Love smoothies and I love using kefir with that too. Beautiful. Yum, I love breakfast smoothies … especially with mango! 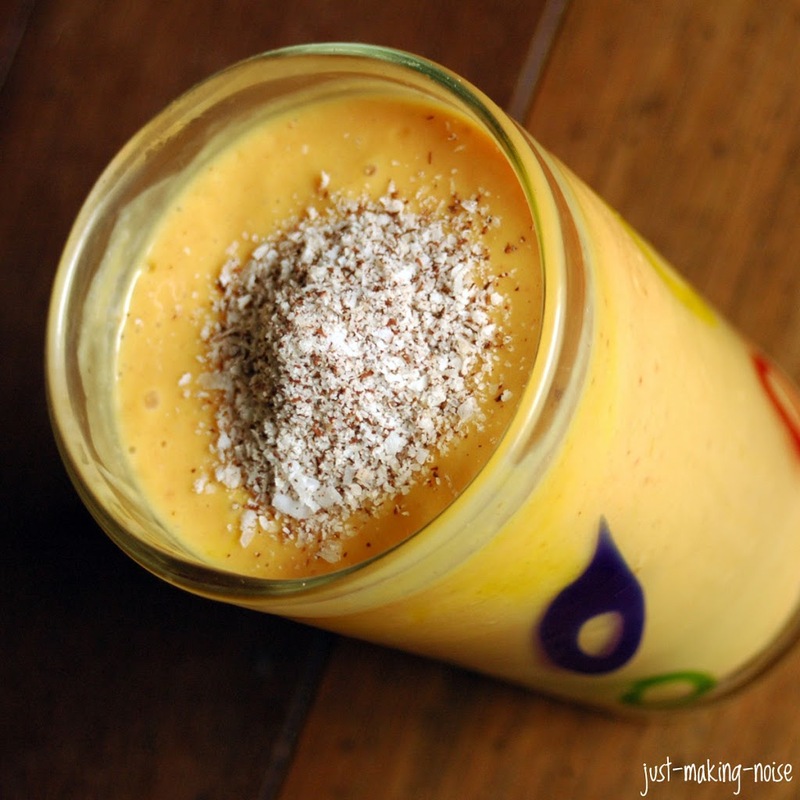 I love that the mangoes in this smoothie represent “Rise and Shine” so much great color! I often have breakfast smoothies in the morning because I find they provide a lot of energy and great nutrition to start the day. Great minds think alike, I just posted about breakfast too!!! But wow, this smoothie looks great! I will have to try it – love the kefir and eggs! Loved the presentation of your recipe. It looks very healthy and tropical. I have looked at your recipe and will be trying it soon. Natasha – I hope you enjoyed your smoothie! I love making this, but it is so hard not to drink it all because it is so good! Can I just add the whole egg? I never use just egg whites. We just made this smoothie for breakfast! Yum!!!! !